Oysters have been eaten by people for thousands of years due to their high protein and mineral content. They were abundant in Victorian times being commonly eaten pickled by the poor. However, oysters were fished to almost extinction after this time and have only just started to recover in recent times after The Ministry of Agriculture and Fisheries pioneered research into oyster farming in the 1960's. Oysters are now considered a delicacy and are more often than not eaten raw, traditionally with a Mignonette sauce of red wine vinegar, diced shallots and black pepper. However, with cooking techniques considerate to their gentle texture and flavour oysters can also be poached, grilled and deep fried. Native oysters are in season in the UK any month with an 'r' in the name while the non native (but still grown in the UK) pacific or rock oysters are available all year round. Look for oysters with tightly closed shells with no chips or damage. They should smell fresh and of the sea. Oysters can be kept under a damp cloth in the fridge for 2 days but really are best eaten on the day of purchase. 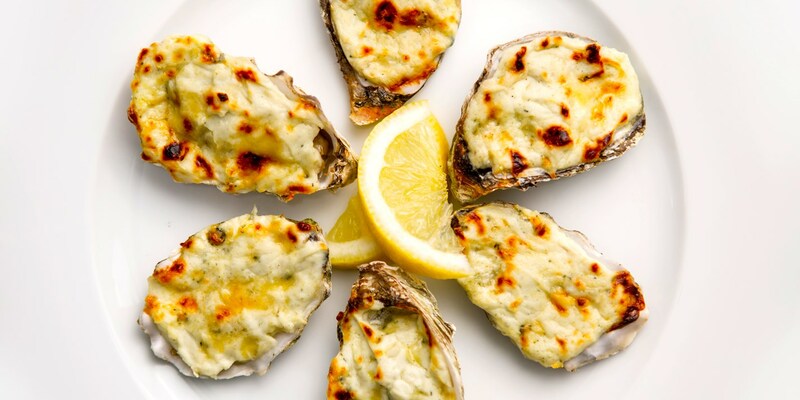 To grill oysters place onto grill or barbecue, when the shells open they are ready to eat. You can serve them with a squeeze of lemon or a splash of tabasco sauce if you prefer a little heat. To poach oysters, put them in a small pan and cover with the liquid reserved from opening. (If there is not enough liquid to do this add some salt water, 5% salt to water is a good ratio). Put the pan on a very gentle heat and cook for 1 minute until the oysters have puffed up and are firm to the touch. The liquid should not go above 60c as this will cause the oysters to overcook and become tough. Keep it simple with Bryan Webb's oysters with laverbread, or if you are entertaining, Chris Horridge's oysters tempura are the perfect appetizer. Oysters are the most evocative culinary symbol of passion so naturally we have romantic starter ideas to help impress on a romantic evening. The stunning scotch langoustines with oyster purée by Adam Simmonds is a beautifully presented, tasty oyster dish that will please the fussiest of dates.